Der naechste Zombicide-Ableger wird wohl Xenocide heissen und das SciFi-Genre bedienen. Sci-Fi ist nicht so meins. Aber mal sehen, was sie draus machen. Yippie endlich mal ein Zombicide Setting das mich anspricht. Sweet! Hab mal den Titel angepasst. In their search for new sources of fuel, humans came across PK-L7, a small planet in a remote corner of the universe. Below the surface, they found what they were looking for. Xenium is a dark, oily, organic compound. Once refined, it becomes a game-changer for intergalactic exploration. It wasn't long before a colony was set up and teams of soldiers and scientists began extracting the Xenium. There, deep underground, was where the first assaults began. The Xenos were vicious, unrelenting, and mindless in their attacks. Survivors have had to fight for their lives against an out-of-this-world threat that just won't stop. 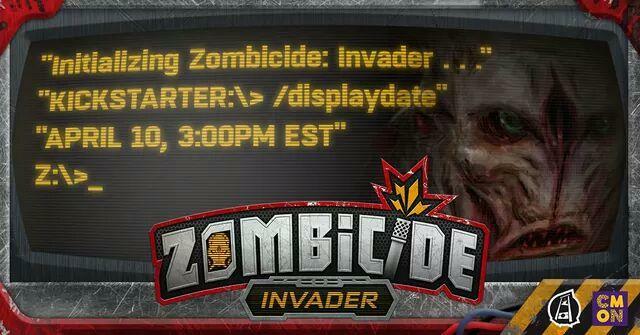 On April 10th at 3pm EST, Zombicide: Invader is coming to Kickstarter. Zombicide: Invader is a cooperative game where 1 to 6 players face Xenos, an unfathomable swarm of infected Xenos controlled by the game itself. Each player takes on the role of 1 to 6 Survivors in a sci-fi setting being overwhelmed by these Xenos. The goal is simple: choose a Mission, complete its objectives, kill as many Xenos as possible, and (most importantly) survive! Lässt mich bisher kalt, mal sehen was kommt. Also ich persönlich mochte die klassichen/Black Plague/Green Horde Zombies mehr als diese Aliens. Der erste hat schon wieder so'n Dance-Moce drauf. Was wird das, Zombicide: Saturday Night Fever?